We taught the Guides to knit. But I gave them a little help getting started and cast on 42 times. One Photo and Twenty Words is hosted by Abi over at Creating Paper Dreams. Pay her a visit (she's lovely!) and see others' pictures. Above and beyond, I'd say! Fabulous photo ~ just bursting with colour. Blimey, you must have a sore thumb! (Or perhaps you don't cast on that way). You have really given them a leg up :). Love thr rainbow photo too. Love the colour in that photo. 42 casting ons? What patience you have! What a neat skill to learn and how nice of you to cast on that many times. I am so impressed at how many you cast on. Dedication! The little girls at the school I volunteer in have really got into knitting. It's funny how these craft trends come around. 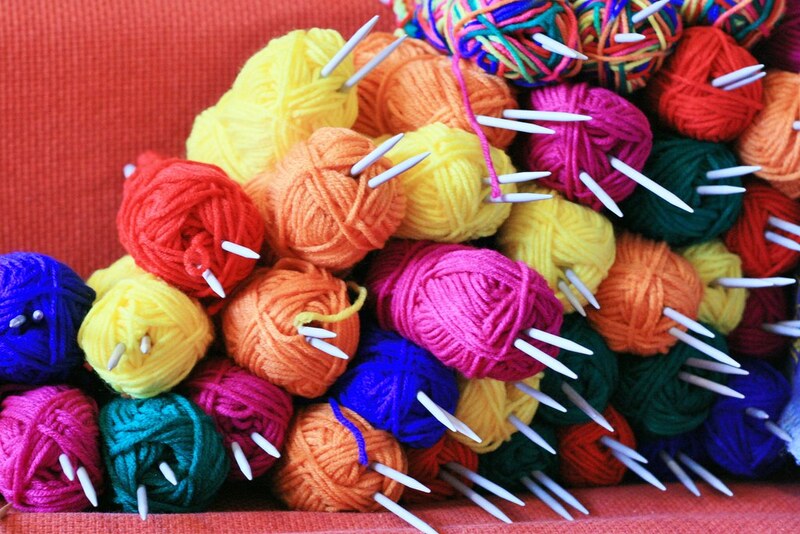 It is the height of cool to walk around age seven with a ball of wool and needles! If only! Thank you for joining in this month Kirsty. Goodness, that is dedication. A great skill to learn. What dedication! Great fun looking colourful photo. That's the bit I love the most...casting on. After that I loose interest. Great photo! Fabulous color, and a great time to learn how to knit. I think I'd be much better if I'd learned earlier.